Tech giant collects 'miniscule' amount of data that is used for ads in relation to what it collects in total. Google is getting so good at predicting internet users’ behaviour that it is seeing "tangible" reductions in the amount of data it needs to serve personalised ads. 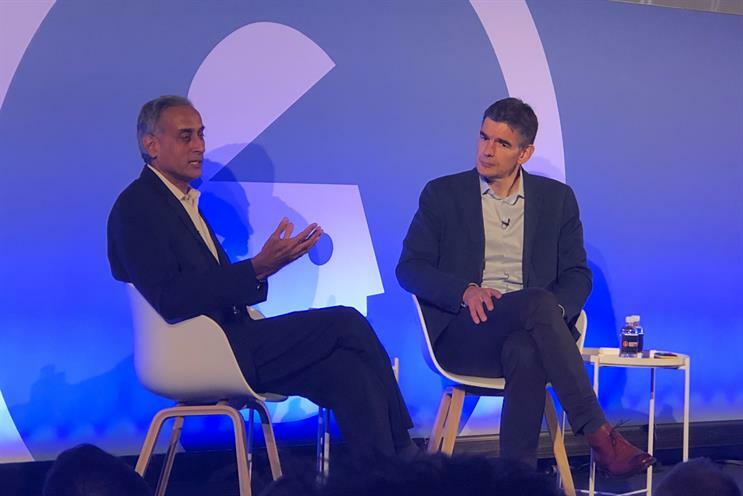 Prabhakar Raghavan (pictured, above left), senior vice-president of advertising and commerce at Google, called the amount of data that it uses to serve ads, compared with how much data Google collects about people as a whole, "a tiny blob" within another "tiny blob". Asked by Campaign during a press conference on what monetisable data sets Google has stopped collecting as part of a self-stated aim to use less data for monetisation, Raghavan did not answer directly but described the amount it did collect as "miniscule" compared with the overall amount. He said: "If you look at all the data Google has, much of it is private content which we don’t monetise. Only a miniscule fraction of this is activity data. If this room is all the data Google has, there’s a little blob in the corner that’s ‘activity data’ that is always used for enhancing experiences and personalised ads. "If you then take that little bit and blow it up again to the size of this room, it’s again only one little corner that we actually use." Raghavan spoke to journalists today after giving a speech at Advertising Week Europe about how Google is supporting an online advertising ecosystem that is privacy-conscious. During the talk, he revealed that he challenged his team to use the "least amount of data that we can to provide advertising experiences". Google has been the subject of privacy concerns by regulators around the world and in January it was hit with its first fine under the European General Data Protection Regulation because it failed to properly obtain user content. However, Raghavan said Google is able to use less and less data about people compared with previous years because its machine learning, used to predict user behaviour online, is getting so advanced. "We’re getting better and better at this, simply because the algorithms that build the machine learning are getting better over time," he explained. "I almost view it as a responsibility for us as a technical team to contract further and further to do any form of personalisation." The extent of how Google could disrupt, for example, the tourism industry came to light in September last year when it launched "Potential trips", in which data from its myriad apps – such as Gmail, Maps and search – can be used to offer unrivalled personalisation in flight and hotel search, activity recommendations and destination guides. While online privacy protection for people has become much stronger in Europe since the enactment of GDPR last year, it is not clear how regulators will respond to the rise of Google as a predictor of user behaviour. In January, Google published a white paper in which it acknowledged that there are "policy questions" to be asked with respect to how artificial intelligence is regulated. Last year, thousands of employee protests prompted Google to abandon work on the US Department of Defense’s flagship AI initiative, Project Maven, in which Google’s tech was being used to interpret drone footage. In terms of how AI would be used in online advertising, Raghavan said: "As we get better, I expect [user agreement] policies will also evolve over time. So you should watch this space." When challenged by Campaign on whether Google has been sufficiently examined by authorities over the ethics of its use of predictive analytics, its president of EMEA business and operations, Matt Brittin, insisted that users are in control over what data is shared by them. "If I create a file that is private and keep it private, then I’ve got control over it," he said. "So I think what’s interesting about the way that Google’s worked is it’s been not who you are or who your friends are, or what’s something that someone’s searching for in Piccadilly right now, that’s been the useful data." He went on: "Actually through Google Trends, we make that data available so that in a way that’s useful. It’s not saying ‘This person did X’; we certainly don’t do device fingerprinting. But if you’re a shop in Piccadilly, and you sell women’s dresses, knowing someone’s looking for a dress right now in Piccadilly is useful, but also being able to use Trends and see the seasonality of demand over time is useful because it could influence how you manage your stock. So I think that’s much more how Google operates and how activity data is useful. Beneath the headlines, it’s a very different world from the one you characterise."